Troy Doucet of Columbus, Ohio Law Firm Doucet & Associates Co., L.P.A. Troy's life experiences have shaped who he is today, and why he does what he does. In 2005, Troy's previous business collapsed, putting him into bankruptcy at 26 years old. He lost his home to foreclosure, and his marriage collapsed soon after. Before that, he ran a good business helping people. In 2004, a national magazine featured him as its cover story when he proposed the mortgage industry eliminate junk fees from all mortgages. His mortgage company did that early on. However, his good work wasn't enough to keep the business afloat. In 2006, he was forced to start over. He returned to finish his undergraduate degree in economics at The Ohio State University. He then went onto law school, where he graduated at the top of his class from Capital University Law School. He focused on classes that would help him fight banks on behalf of people. He excelled in classes like Consumer Law, Real Estate Finance, Complex Litigation, Conflicts of Laws, and Contracts. That coursework shaped him into the litigator he is today. Troy started volunteering at the legal aid society in law school. He graduated with more pro-bono hours than anyone in his class. After he graduated, he began attending the pro-bono legal clinics put on by the Legal Aid Society of Columbus, and still volunteers monthly. Troy is so committed to helping the poor that he hired and paid for a dedicated lawyer just to handle pro bono matters. Troy funded that position for about two years. Troy's tough experience with bankruptcy and foreclosure taught him much about what banks and creditors are willing to do when enforcing their rights. It solidified his interest in protecting the “little guy” and fighting for their interests. Because of this, Doucet & Associates Co., L.P.A. is a law firm dedicated to helping those in foreclosure, and consumers facing problems with businesses. Troy’s previous business was a mortgage company. Due to his years of work in that industry, he has a unique and comprehensive understanding of mortgage financing and foreclosure defense. He published a 440 page book about litigating foreclosure cases in 2008, titled, 23 Legal Defenses to Foreclosure: How to Beat the Bank, and then published an integrated copy of Regulation Z in 2009, titled Regulation Z of the Truth in Lending Act: 12 C.F.R. Part 226. In 2014, he published The Art of War for Lawyers. Troy was born in 1979 and grew up in a military family. His father flew B-52 and O-2A airplanes and retired from the Air Force after 30 years of service, completing his career as a Colonel at Wright Patterson Air Force Base in Dayton, Ohio. Troy graduated from Centerville High School (near Dayton, Ohio) in 1997. He resides in Hilliard with his wife Julie, and has a thirteen-year-old daughter. Troy is a member of the Central Ohio Association for Justice, and is a member of the American Bar Association, Ohio State Bar Association, Columbus Bar Association, Ohio Association for Justice, and the American Association for Justice. He is licensed to practice law in all Ohio state courts and Ohio’s federal courts, The United States District Courts for the Northern and Southern Districts of Ohio, the federal Sixth Circuit Court of Appeals, and the Supreme Court of the United States. Troy has been named a Rising Star by Super Lawyers magazine since 2014. He won their national Pro Bono award in 2014 too. He has an AV Preeminent Rating from Martindale Hubble, and was recently named a Top 100 High Stakes Litigator for Ohio. He ran for State Representative for Ohio's 21st District in 2018. Troy talks about savings our clients’ homes from foreclosure. Troy and his wife, Julie. Troy with his sister, Karla, and father, Dennis, in Washington, D.C. 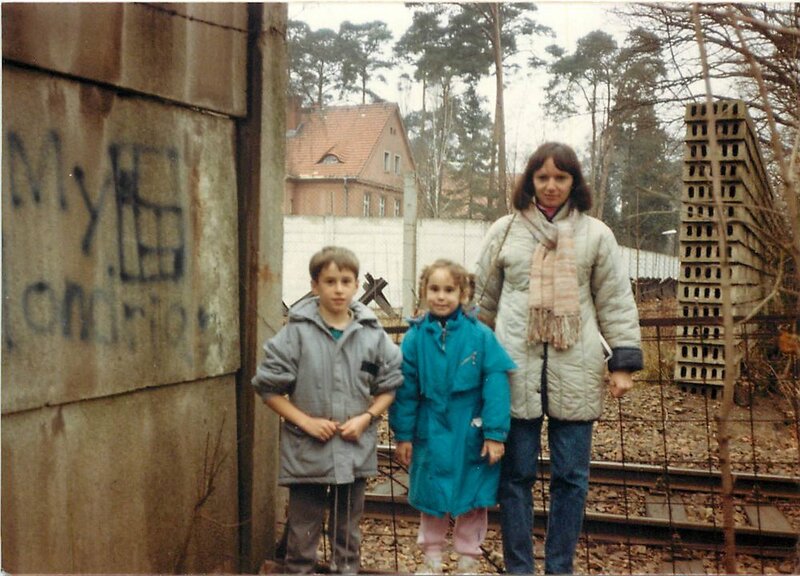 Troy and Karla with mom, Connie, in West Berlin at the Berlin Wall in the late 1980's. Troy was involved with a business during high school called Creative Ties. Troy with his dad and daughter, Alondra at law school graduation. Marais v. Chase Home Finance, LLC, 736 F.3d 711 (6th Cir. 2013) – This seminal decision under the Real Estate Settlement Procedures Act created 6th Circuit precedent regarding a borrower’s ability to maintain a claim under RESPA. Slorp v. Lerner Sampson and Rothfuss, 587 Fed.Appx. 249 (6th Cir. 2014) – This case created 6th Circuit precedent allowing a borrower to bring a claim under the Racketeer Influenced and Corrupt Organizations Act (“RICO”) against a bank and the law firm representing the bank for actions taken in pursuit of a state foreclosure. Importantly, the Court expanded the interpretation of property injury and recoverable damages under 18 U.S.C § 1964(c). Majestic Building Maintenance, Inc. v. Huntington, 864 F.3d 455 (6th Cir. 2017) – Here, the 6th Circuit affirmed the UCC principle that a bank could not disclaim its duty to act in good faith and exercise ordinary care under the Uniform Commercial Code, one of the first cases nationally on this issue. Wells Fargo Bank, N.A. v. Gerst, 2014-Ohio-80 – The Ohio 5th District Court of Appeals established that compliance with HUD Regulations was a condition precedent to foreclosing on a Fair Housing Administration mortgage loan. In re Forson, 583 B.R. 704 (Bankr. S.D. Ohio 2018) – This case alleged a lender illegally demanded money on portions of a debt that was discharged in bankruptcy. The court held that the lender violated the bankruptcy discharge injunction under 11 U.S.C. § 524. In re Beiter, 590 B.R. 446 (Bankr. S.D. Ohio 2018) – This case alleges that a lender illegally demanded money on portions of a debt that were discharged in bankruptcy. The case is one of the first nationally to allege violations of bankruptcy discharges as a class action in bankruptcy court. It is ongoing. Washington v. Green Tree Servicing LLC, No. 1:15-CV-354, 2017 WL 1857258, at *1 (S.D. Ohio May 5, 2017), adopted, No. 1:15CV354, (S.D. Ohio June 15, 2017) – Federal trial court expanded the “reasonable diligence” standard under RESPA and the FDCPA for mortgage lenders, benefiting consumers. Justice v. Ocwen Servicing, LLC, 2:13 CV 165 (S.D.Ohio 2014) – Summary judgment decision on claims under the FDCPA, TILA, and RESPA. The court interpreted servicers’ requirements to respond with information specifically requested by the customer. Richard v. Caliber Home Loans, Inc., No. 2:15-CV-2647, 2017 WL 4349082 (S.D. Ohio Sept. 29, 2017) –FDCPA and TILA claims against a mortgage servicer with complete defense against seven counterclaims. MDL In re Fed Loan Student Loan Servicing Litigation, 2:18-md-02833-CDJ (E.D. Pa.) – Doucet has been appointed to the Executive Committee of this MDL that involves up to 325,000 student loan accounts. Lester v. Wow Car Co., 675 Fed.Appx 588 (6th Cir. 2016)) – This Sixth Circuit decision dealt with litigation surrounding the Truth in Lending Act, Ohio’s CSPA, and claims against whether finance charges related back. Rose v. Friendly Finance, 2016 WL 6436667 (S.D. Ohio 2016) – This consumer class action was filed to protect the interests of consumers who financed vehicles with a company that had an alleged illegal kickback scheme. Bauman v. Bank of America, N.A., 808 F.3d 1097 (6th Cir. 2015) – This case arose from an FDCPA claim and conduct by a bank during foreclosure, and alleged compulsory counterclaims had been waived. Hill v. Homeward Residential, Inc., 799 F.3d 544 (6th Cir. 2015) – This TCPA case alleged hundreds of robo-calls against a mortgage servicer without sufficient evidence of consent to receive the same. PHH Mortg. v. Ramsey, 17 N.E..3d 629 (Ohio 10th Dist. 2014) – Successful defense of a verdict in favor of a foreclosed homeowner, where the court found the mortgage company breached the terms of the mortgage. Cassidy v. Teaching Co., LLC, 2014 WL 4377843 ( S.D. Ohio 2014) – This class action alleged a seller of consumer video courses violated the FTC’s Order on false advertising discounts and Ohio’s CSPA. In re Dibling, 514 B.R. 254 ( S.D. Ohio 2014) - Successful adversarial proceeding for bankruptcy violations. Nour v. Shiwar, 2014 WL 3058296 ( Ohio 10th Dist. 2014) – Attorneys’ fees appeal following a successful jury trial for firm’s client regarding capital improvements for a business lease in a daycare center. Union Sav. Bank v. Schaefer., 2013 WL 6843607 ( 10th Dist. 2013) and Flagstar bank, FSB v. Cintron, 984 N.E.2d 398 (2nd Dist. 2012) – Cases litigating TILA rescission of residential mortgage refinances. Shoptaw v. I& A Auto Sales, Inc., 2012 WL 6738672 ( 10th Dist. Ohio 2012) – CSPA case involving the interstate sale of a vehicle and personal jurisdiction of defendants. U.S. Bank v. Gray, 2013 WL 3963471 (10th Dist. Ohio 2013) – Foreclosure matter involving the applicability of UCC Article 9 §§ 203 (g) and (f) and whether note can follow a mortgage. Bank of America v. Robledo, 2014 WL 1350917 (10th Dist. Ohio) – Successful foreclosure appeal reversing trial court decision on whether the bank complied with all conditions precedent.